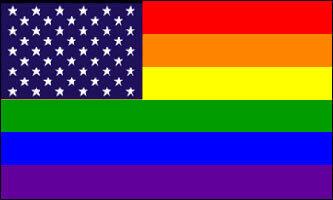 The New Old Glory Rainbow Flag is a recent development. It is based on the Rainbow Flag and uses the 50 stars on a field of blue in the canton from that of the flag of the United States of America to stress that equal rights for gays and lesbians are crucial in all 50 states. PRINTED NYLON: Printed nylon is an economical flag. The flag is printed as (1) unit. How long will the flag maintain the colors is based entirely on your location, weather, how often the flag is displayed. SEWN NYLON: Sewn Nylon is color strips of the flag sewn together to form the flag. This type of flag is a higher quality flag and can expect to have a life longer than the PRINTED NYLON. Again, how long will the flag maintain the colors is based on your location, weather, how often the flag is displayed and cared for. GROMMETS: Grommets on the flag is the typical configuration of most flags. The flag poll has (2) hooks that hold the grommets/flag in place. The pole can be purchased at most local hardware stores. SLIDE ON POLE: This type of flag has a sleeve built on the end of the flag, which slides on the pole (usually by sliding the flag from the bottom, up). This type of flag has two tabs, on the inside of the top and bottom of the sleeve to attach to hooks located on the pole to hold the flag in place. SIZE OF FLAG: We offer several size types of to suit the individuality of our customers and their space requirements. The “typical/popular size” of flags is the 3ft x 5ft. This is the size many people put in front of their homes.